Alexander is everyone's favorite boy, struggling against those obstacles that seem to get in the way of growing up, with the most formidable ones being his siblings. Here, all three Alexander stories are combined in one book, a perfect way for Alexanader to be introduced to a whole new generation of certain fans. In 1972, acclaimed author Judith Viorst introduced the world to everyone's favorite little brother in "Alexander and the Terrible, Horrible, No Good, Very Bad Day". Now all three stories are available in one volume with a charming Introduction by the author. 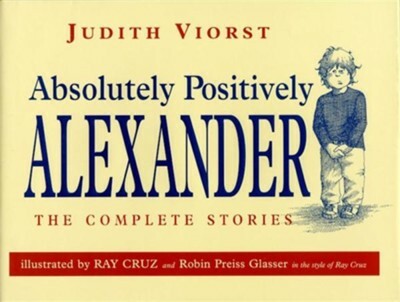 Judith Viorst writes in many different areas: science books, childrens chapter and picture booksincluding the beloved Alexander and the Terrible, Horrible, No Good, Very Bad Day, which has sold some four million copies; adult fiction and nonfiction including the New York Times bestseller, Necessary Losses; poetry for children and adults; and four musicals. Her most recent books of poetry include What Are You Glad About? What Are You Mad About? and Nearing Ninety. Robin Preiss Glasser is the #1 New York Times bestselling illustrator of the Fancy Nancy series, written by Jane OConnor; America: A Patriotic Primer, A Is for Abigail, and Our Fifty States by Lynne Cheney; and Tea for Ruby by Sarah Ferguson, the Duchess of York. She lives in Southern California with her family. I'm the author/artist and I want to review Absolutely Positively Alexander: The Complete Stories.